Clothing is an often overlooked piece of gear for a novice backpacker. After spending hours researching the perfect backpack, shoes and tent; clothing often relegated to the last day's quick ferret through the closet. Yet, trekking clothes are more than just a style statement. Every piece of clothing is your mobile shelter and the first line of defence against inclement weather and rough terrain. Read our article on 9 essential clothing essentials for a three season trek in the Indian Himalayas. Used for more than a year and for around fifty treks all over the Indian Himalayas. From Lower Himalayas to Dhauladhars, Pir Panjal and Kishtwar Himalayas. Elevation between 1800 to 4800 metres and across terrain ranging from mud to rock and snow. Worn in temperatures as low as -17 C and as high as 38 C.
Quechua Forclaz 900 are available in one colour: light grey with black panels. These trousers can double as casual lowers or work pants. We have worn them around town and on motorcycle tours and they do not feel out of place. As a reference a size 40 /M fits a male with a 31 waist. Decathlon trouser fit chart. Image © Decathlon India. The trouser waist is partially elasticised which allows a little leeway in waist sizes. The waist features robust belt loops. A synthetic belt with a plastic buckle is provided to keep things snug. Yet, the belt is the first thing we threw away because it digs in uncomfortably when you cinch a backpack's hip belt over it. The trousers are comfortable around the crotch and thighs. The cut is athletic and unlike baggy cargo pants they do not flap in the wind. The fabric is easy on the skin and it will not scratch or rub you raw while wearing them. For most Indian males the length of the trousers is a little longer, especially when hiking in sandals. Forclaz 900 has four zippered pockets: two slash pockets in the front, a hip pocket and a rear pocket. Zippered pockets are important because trekking gear will not slip out inadvertently. All four pockets on these trousers are taped and use YKK zippers. The tape ensures that water doesn't get in and the zipper does not snag on trouser fabric. This is an excellent design touch. The fabric for the trousers is 6% elastane and it has a slight horizontal stretch with hardly any vertical stretch. Although the trousers are not stretchy enough to go bouldering or to climb rocks with, yet they don't constrict movement either. Our trekking trouser fit test includes a set of 20 squats and walking lunges. A correct fit should allow freedom of movement without chafing the crotch, thighs or hips. This video explains how to do walking lunges. Walking lunges are an easy way to check whether a pair of trekking trousers will fit you or chafe you over a trail. The lower legs have a cuff and two snaps (a loose position and a tighter position) that allow the pant to be cinched around any hiking or mountaineering boot. However, there is a great deal of fabric around the trouser bottoms leading to an almost bell bottom effect. We can see the need for such a large amount of fabric because these pants must be compatible with heavier and stiffer high altitude boots, but it is a nuisance when walking barefoot around camp sites. Walking barefoot, the snap falls right under the heel and the trousers have to be hitched up every once in a while to keep the snap away from the heel. In winters, the cuffs tend to trap snow when hiking. These trousers are laudable for their ability to wick sweat and dry quickly. Through warm summers, humid monsoons and cold winters and we were never hampered by accumulated sweat. We were so confident in their quick drying ability that this was the only pair of trousers we carried for our two week winter trekking expedition. We would wash these trousers (without soap) in a mountain stream and they would be good to wear after an hour. On most of our monsoon treks we carried a poncho and this meant that the trousers had to face a fair bit of rain. Make no mistake, these trousers are not waterproof and heavy rain shall seep in. Yet, these trousers do not absorb water or become heavy. The athletic cut ensures that a waterproof shell easily fits over them. In winters, they block wind and have done well in shedding snow. These trousers and not insulated and are unsuited for extreme cold temperatures, unless combined with a inner layer. However, a long underwear fits comfortably underneath. The trouser fabric is a ripstop polyamide and this is reinforced at the knees and at the bottom. After an year of trekking, the only wear these trousers have to show is a broken metal snap button on the lower left leg (still works though) and a few small snips. The seams have all held well and even glissading over snow has left no visible scars or tears across the reinforced bottom. The stitching is good as new and all zippers and snap buttons work well. This makes these trousers extremely durable in our book. However, after an year of use the fabric has lost its water shedding ability and it doesn't repel water just as easily. Similarly the trouser fabric starting to hold stains now. 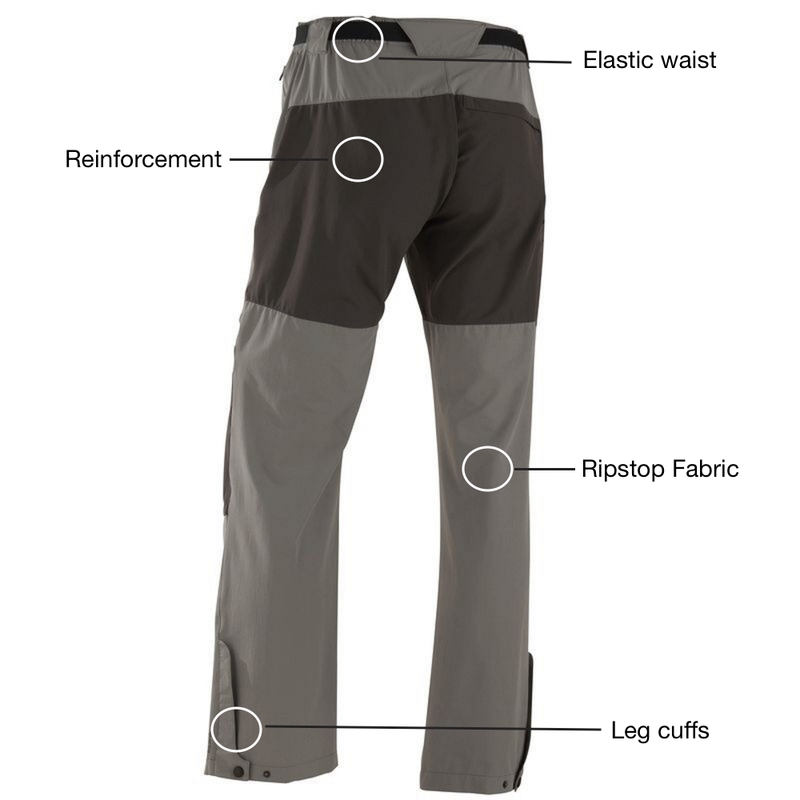 Quechua Forclaz 900 / Bionassay Pant 500 are an extremely durable pair of trekking trousers. Comfortable between 0 and 35 degrees C, these trousers make an excellent companion for mountain trekking. The biggest flaw with these trousers is the leg cuff design which catches snow in winters and is a nuisance when walking barefoot. Other than the leg cuff there is little to complain. The trousers are hydrophobic and do a good job at resisting wind, and snow. Although these trousers are not waterproof they do not absorb water and are quick to dry off. Some people may be put off by the price but these trousers are less than half the weight of a regular pair of denims and will last twice as long.